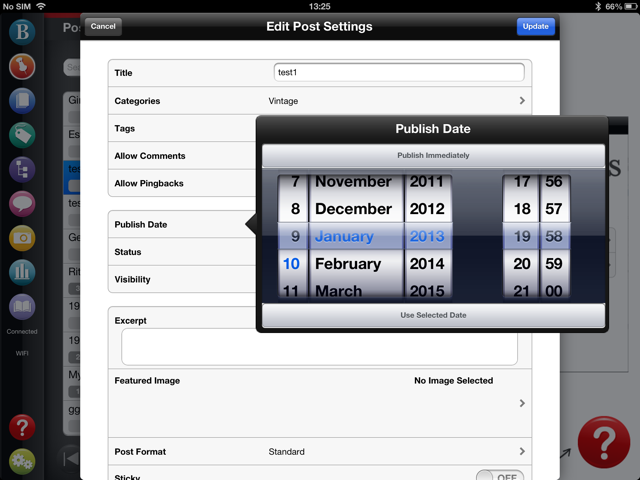 Useful tips for inserting and uploading images to your WordPress blog using BlogPad Pro and the settings which can save you time whenever you add a photo. You can control the size of your image either by adjusting the image width and height fields or by using the % slider underneath the image preview. If the lock proportions tab is set to ‘ON’ the photo won’t be able to get squashed to the wrong aspect ratio. When you add a new image from your camera roll the image will be uploaded at the size you set in the image width and height fields (above). 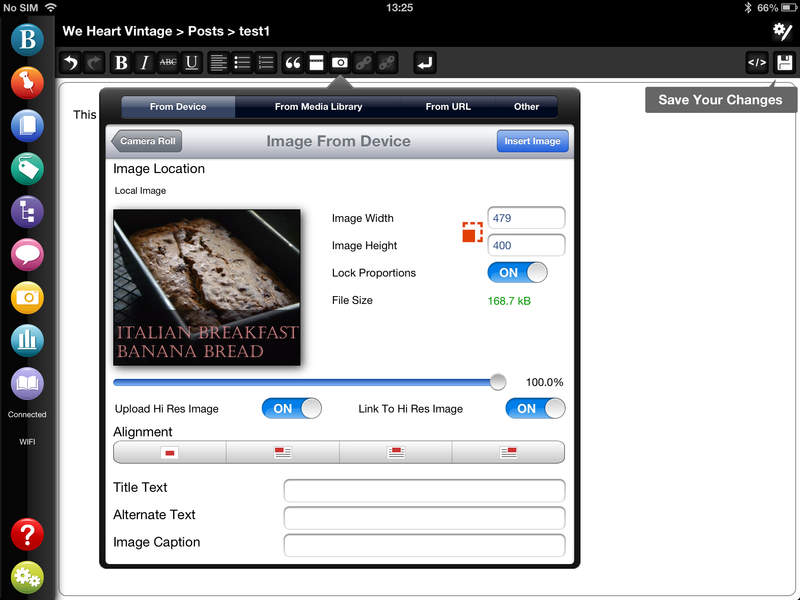 If you would also like to upload a hi res version of your image turn the ‘Upload Hi Res Image’ option to ON. Next to this option you will also see a ‘Link to Hi Res Image’ option which automatically links the image in your blog post to a hi res version. If you don’t check this option the hi res image is just uploaded into your media library for future reference. It’s useful to know the maximum image size your blog theme can handle, otherwise images can end up being cropped, squashed or breaking your page layout. If you edit your blog across multiple devices, have multiple authors, or use both your iPad and the web browser to edit your blog there are a few things you need to remember. 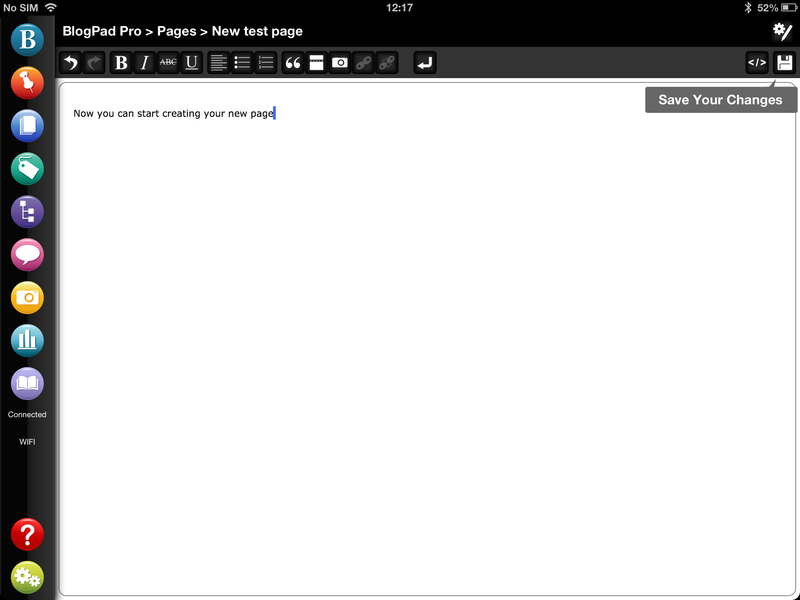 Before you start editing your blog in BlogPad Pro on your iPad ALWAYS grab the latest version of your blog posts. 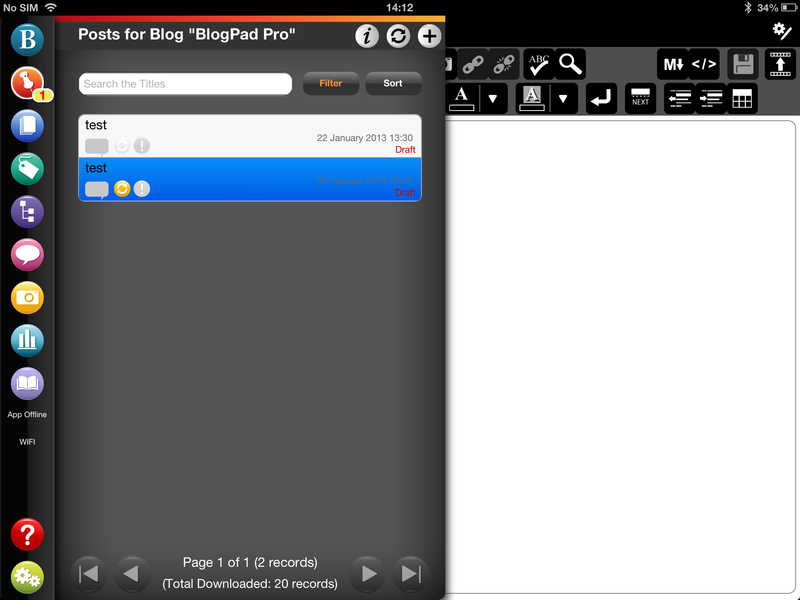 After making changes via the Dashboard, when you go back to BlogPad Pro you MUST download those changes – there is no way for BlogPad Pro to know that you made changes via the Dashboard unless you refresh BlogPad Pro. 1. 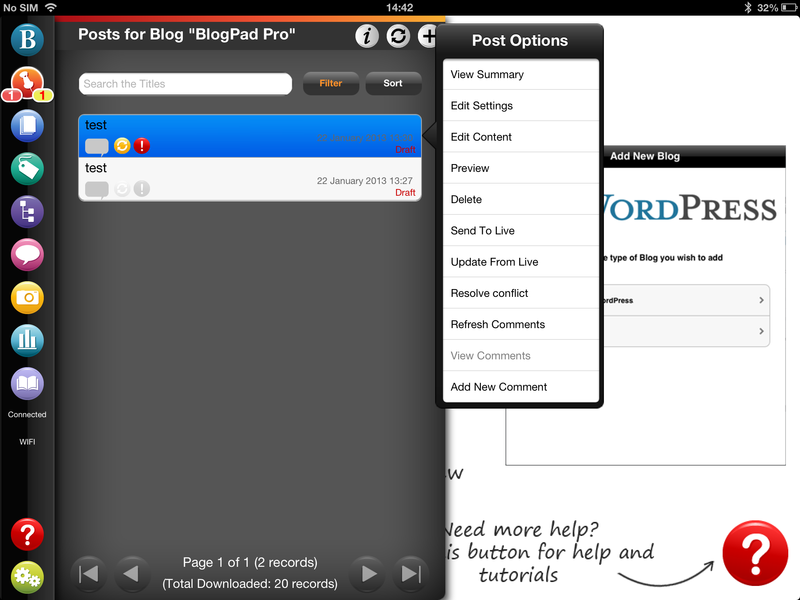 If you want to refresh your whole blog go to Manage Blogs > Blog Options > Update Blog From Live. 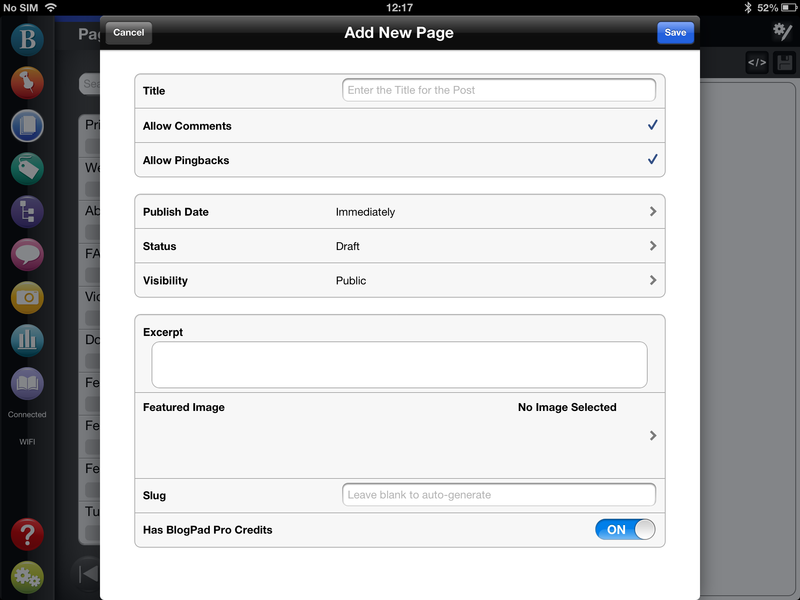 This refreshes your posts, pages, media library, tags and categories. 3. If you just want to grab the latest version of 1 particular post or page tap on the post and select ‘Update From Live’. If you forget to do this, or if other people have access to edit your blog you can find that you have a conflict when you go to save your post with BlogPad Pro. N.b. Also if you leave a Post open in edit mode in your computer’s browser whilst you are also working on that same post in BlogPad Pro, you WILL get conflicts. This is because the WordPress dashboard performs an auto-save every so often. When it does so, it alters the “Custom Fields”. So when BlogPad Pro is comparing it’s own copy of a Post with that from your blog’s server, it will see that the custom fields have changed on the version on your blog’s server, so will mark the Post as in conflict even if the content is identical. This seems to happen with self-hosted blogs only. Just make sure you close the edit screen in your browser before you start editing in another device. A conflicted post will either show up as a red ! icon when you update your posts. You can also see that there is a red notification badge on the ‘Posts’ menu option which shows you how many conflicted posts you have. You can also use the ‘filter’ option to just show the conflicted posts or post which need to be synced. 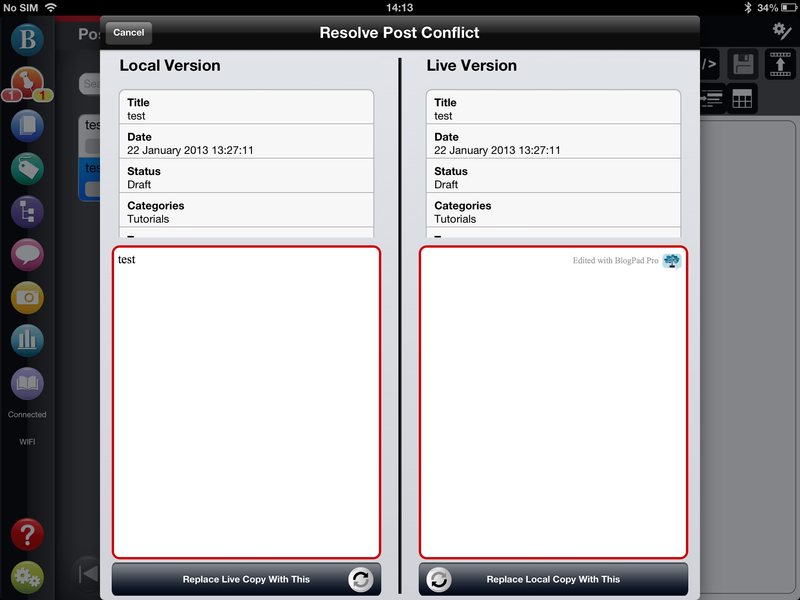 To resolve this conflict tap on the post in the list and in ‘Post Options’ select ‘Resolve Conflict’. If you get this message tap OK to resolve the conflict. In both cases you will see a screen like this one which compares both saved versions of your post and highlights the areas which have been changed with a red border. You can see in the screengrab below that the content is different and is highlighted. Just select whichever side is correct to resolve the conflict. 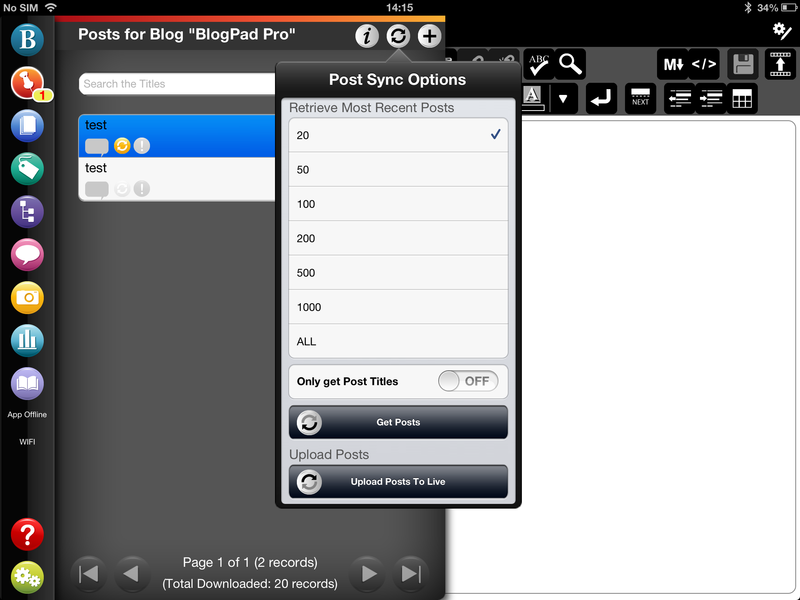 How to sync your posts and pages in BlogPad Pro once you have been working offline. 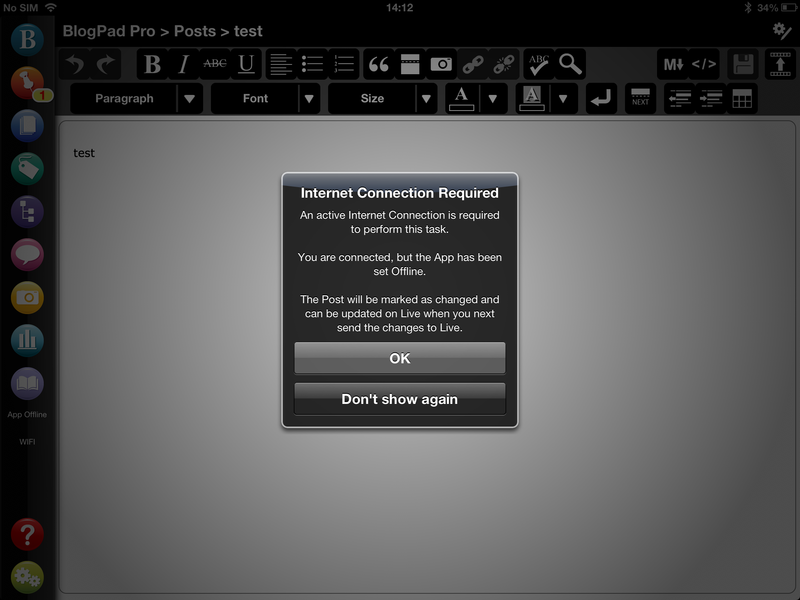 If you have been working offline or without an internet connection with BlogPad Pro you will need to sync your posts and pages once you get back online again so that all your hard work gets uploaded. 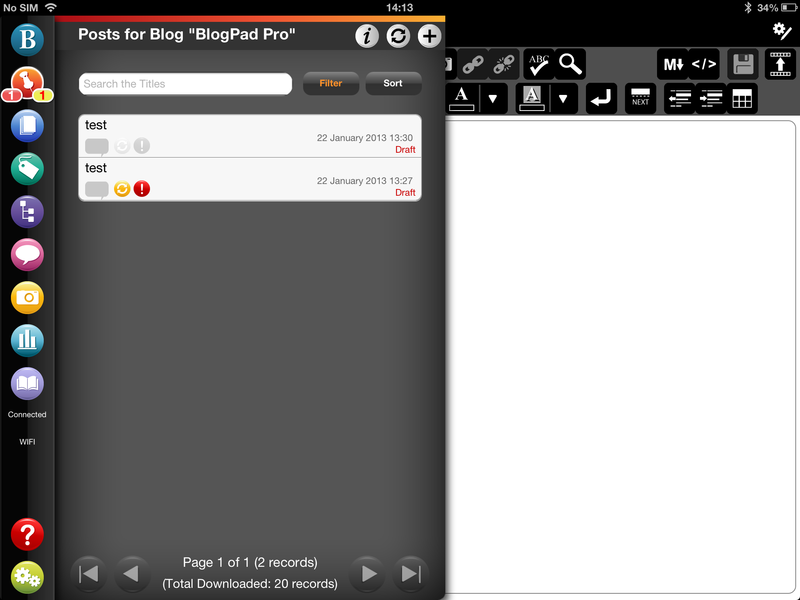 Similarly, if you have been working via the WordPress Dashboard, you need to update BlogPad Pro with those changes. You can read more about this here. 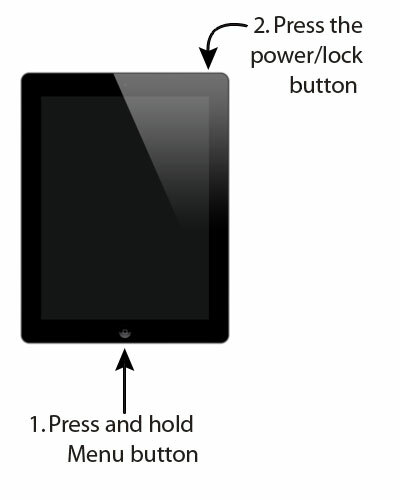 This tells you that your post or page has been saved on your iPad. Your post will now be marked with a yellow ‘Sync Required’ button in the list of posts (see below). You will also notice a yellow notification badge next to the ‘Posts’ option in the menu with a number 1 in it, this tells you how many posts you have edited on the device but need syncing. When you are back online and ready to upload your changes, tap on the ‘Sync’ button and from the ‘Post Sync Options’ menu select ‘Upload Posts to Live’ . If the post you are uploading has been edited in the web browser or on a different device since you went offline this will create a conflict, as shown by the red ! icon (below). You can also see that there is a red notification badge on the ‘Posts’ menu option which shows you how many conflicted posts you have. This symbol indicates that both the local copy and the online copy of that post have BOTH been edited. To resolve this tap on the post in the list and in ‘Post Options’ select ‘Resolve Conflict’. This launches a screen which shows you both versions of the post and highlights the areas which have been changed with a red border. You can see in the screengrab below that the content is different and is highlighted. Select whichever version is correct and your post will be updated. 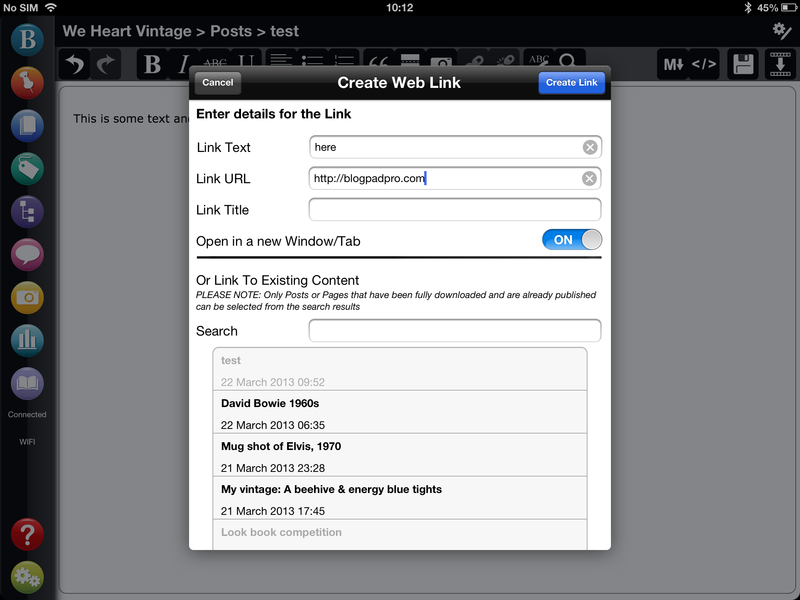 We’ve just submitted version 1.2 of BlogPad Pro app to the App Store and we’re waiting for it to be approved. It’s packed with new features and improvements as well as some bug fixes. 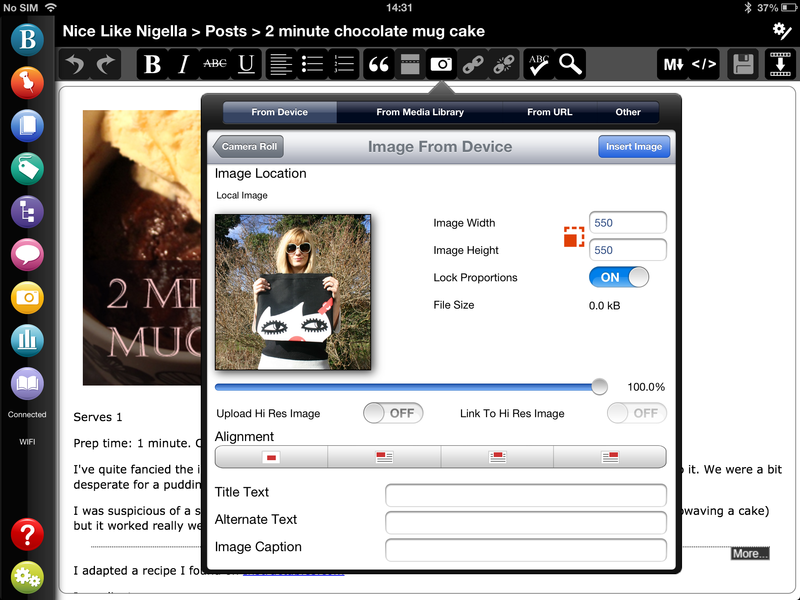 “Next Page” icon added, to represent where a <!–nextpage–>markers appear in the WYSIWYG editor. Ensured that <pre> tag is not the last element on the page, so that users can break out of the <pre> tag without having to go into HTML mode. When the device was rotated when in WYSIWYG mode, and with the Post Options drop down showing, the dropdown appears in the wrong place. Improved handling of XMLRPC responses to handle situations when the returned XML was not valid XML (eg due to bugs with WordPress, or due to custom configuration of self-hosted blogs that could affect the XML output). When “Restore Default Settings” was clicked in General Settings, this would hide any active Editing windows too by adding the “Getting Started” screen on top of the edit window. If a Blog was deleted from the device whilst a Post from that blog was active in the editor, this would cause errors to appear after every autosave. When a Post that had been deleted from the WordPress Web Dashboard, and then the Post was updated from Live within the app, that Post would be removed from the device (correctly! ), but then would still display a “Summary” of that post (it should not!). When selecting a Featured Image in Post Settings, you were able to see other Media Types in the “From Media Library” section. This should only be images. Fixed bug with version 3.4 or greater Blogs where an update to a Live Post/Page which had been deleted from Live wasn’t handle correctly. Now, the user is asked if they want to delete the Post/Page locally. Fixed issue with WordPress-hosted blogs when scheduling a Post that is currently a draft and was initially created using the WordPress Web Dashboard. Before, this would publish the Post immediately. We’ll be publishing more information on these new features and how they work over the next few days, and of course we’ll let you know as soon as the update is available!